Home > Beauty, Wellness and Sports > Health > [GNC Live Well Singapore] Do you have a favourite supplement that you depend on? [GNC Live Well Singapore] Do you have a favourite supplement that you depend on? Do you have a favourite supplement that you depend on? Check out GNC's Buy 2 get 1 FREE deal. Your favourite might just be on promotion! See all deals at http://bit.ly/2iPV8Re. 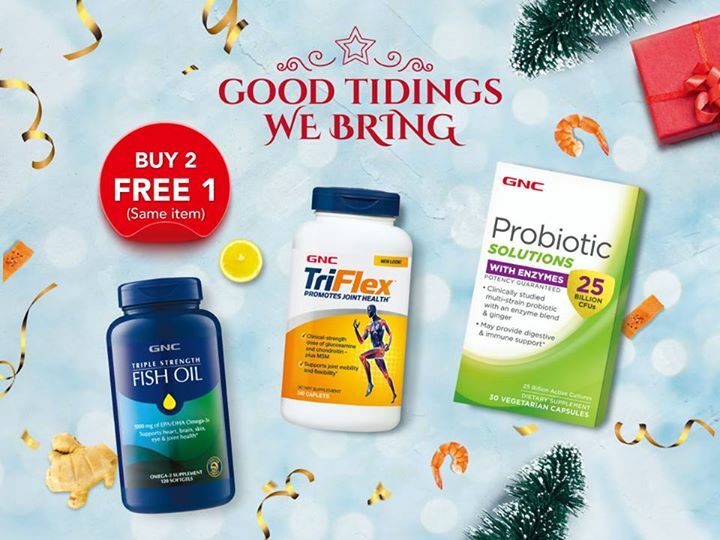 — Products shown: GNC Ultra 25 Billion CFUs Probiotic Complex with Enzymes (30 vegicaps), GNC Triple Strength Fish Oil (120 softgels) and GNC Triflex with Hyaluronic Acid (240 caplets). Previous: [Holland & Barrett Singapore] Happy Holidays and may this season bring you better well being and happiness. Next: [Zalora] Your shopping bag items are on sale!